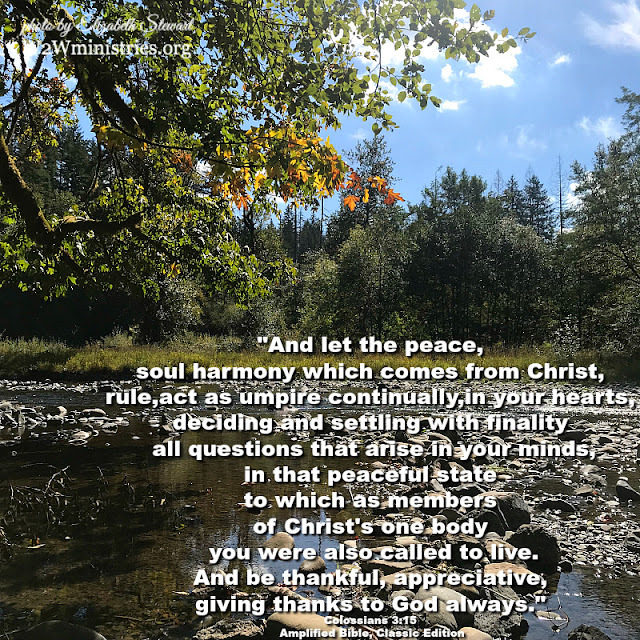 LET -allow to, permit to, give permission to, give leave to, authorize to, sanction to, grant the right to, license to, empower to, enable to- the peace and soul harmony which comes from Christ rule continually in your heart. Thankfully, God shows us the how in the verses preceding and following His instruction to let His peace rule in us. When our thoughts are consumed with our circumstances and problems we are filled with turmoil instead of peace. When we shift our focus onto God Who is ruling and reigning on the throne of heaven and over all creation, we begin to trust that He is well able to handle everything that concerns us and we begin to experience His peace. When we live in fear, guilt and shame it's impossible to live in peace. Colossians 3:3 tells us that our life is hidden in Christ. When you receive Christ as the Ruler and Savior of your life, He takes your sinfulness and wraps you up in His righteousness. Guilt and shame are no longer your portion, peace is! Living in deliberate disobedience to God's word and ways is a peace killer. Soul harmony comes when we live a life of repentance and submission to God-when we trust that His ways are best for us. Offense, anger, bitterness and unforgiveness are like poison to your inner being. It is impossible for these things and peace to coexist. Choose to forgive and to let go of anger and offense and bitterness. When negative emotions and thoughts pop back up, as they inevitably will, say aloud to remind yourself and the enemy of your soul, "I chose to forgive that." Then consistently pray for God to heal your wounded emotions. There's also no shame in seeking good biblical counsel if you need some extra help and support. You've heard the saying, "Oh what a tangled web we weave when first we practice to deceive." Being honest and transparent and real is one of the keys to peace and freedom. As we yield and cooperate with God's Spirit and Word, our mind is continually being renewed and transformed. Staying stuck in old ways of thinking, reacting and responding definitely hinders peace. Letting God's Word wash our mind and His Spirit transform our old mindsets is liberating! Isn't it amazing that God sees prejudice as a peace stealer? God wants us to see everyone through His eyes. That doesn't always come naturally or easy, but it's something that we can ask for His help to do. When we realize that we are God's chosen and beloved one, then it's easier to love others, and to be tenderhearted, merciful, gentle and kind to them. When we are confident in God's love, peace can fill our hearts which enables peace to impact our relationships. The Word of God is the tool God uses to transform us. The more His Word fills up our mind and heart, the more it crowds out all of the negative thoughts and emotions that prevent peace from ruling within. I want to live a life ruled by God's peace. How about you? Cooperate with God in the renewal of your mind resonated with me, Elizabeth because it is so easy to allow our thoughts and perspectives to wander into worrisome places, where peace cannot reside. A continual prayer of mine is for God to renew a right spirit within me, and so often this begins with "letting" him renew my mind. You have encouraged me today!